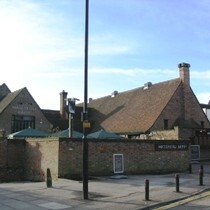 The Waterend Barn in St Albans was opened a couple of years ago as a Lloyds No 1 bar (an upmarket Wetherspoons pub). It is a very large pub and restaurant converted from an old fashioned barn that has been standing for many centuries. It appears that all the original beams, fireplaces and other features have been kept intact. This is an impressive place. They serve real ale with London Pride and Old Speckled Hen or Green King Abbott as standard on the handpumps at the left end of the bar whilst the three handpumps at the right end of the bar serve up guest ales. Drinks are very reasonably priced and they have an extensive selection of bottled foreign beers and a good selection of wine. Just inside the entrance is a large patio area with many tables and chairs. Moving into the pub, the restaurant is on the left and the main bar is on the right. There's plenty of comfortable leather sofas to sit on, making this a nice relaxed place for a drink. Toilets are impressive. Wi-Fi access is provided by The Cloud. After 9pm at the weekends the place becomes very busy and is popular with drinkers in their twenties to early thirties, minimum age for entrance is 21. There is a small entrance fee of £3 or £4 after 9pm on Fridays and Saturdays. During the day this place is popular with all ages as it serves good value food and coffee all day. Most evenings the music is pleasant background music whilst on Tuesday there is a jazz band and at weekends after around 10pm there is a DJ playing the latest sounds until 1am. An excellent venue with great character and atmosphere, good beer, patio area for summer evenings, comfortable, spacious and good mix of people. Real ale selection and availability has been disappointing recently. Also now serving pints in plastic glasses. This may be just at weekends. Score adjusted downwards to reflect these points. Abbott, Ruddles Best and two other ales available. Plastic glasses on Thursday, Friday and Saturday evenings. Now a standard Wetherspoons (no longer Lloyds) with the forthcoming closure of the Crosskeys.